There are subtle differences between the two and the original design. Please let me know if you are interested in building one and if so, which. Martyn - I'm definitely interested in building a KF3, whether or not it gets selected for the 2017 mass build. I have an SC40 and an OS61 currently homeless, so I was actually considering building the full size and using the 61 for it. But that's not yet cast in stone... what wingspan does your 40 size end up as? Mine would definitely be IC. The plans are metric but its really 54" span.. I have already printed out the Flea Fli at 137 percent, this comes almost the same size at 53 inches. The reason for starting with the smaller and enlarging that ( rather than reducing the larger ) is that the Flea Fli already has the former in front of the wing and is designed for dowel and wing bolts rather than rubber bands to hold the wing. Also it has a slightly longer nose - about 1/2 inch so slightly better for electric. As I would only build electric my version would have my usual construction - a 3mm liteply plate ( = tank bay floor) for the Lipo which also reinforces the motor bulkhead. Holes in several places to allow the connectors to pass thro into the compartment underneath for ESC. This has a simple hatch underneath to install ESC but connection is done through a top hatch which also is for removing the Lipo. So the lipo floor is a structural part which connects the ply doublers and both engine bulkhead and wing bulkhead. Worked well on other models for me. Ply doubler. I reckon for electric the 1/32 ply doubler only need to be about half the fuselage height, so a diagonal line from top of the motor bulkhead to behind the wing. Half the normal size, half the weight and half the cost. In my case I want a fuselage mounted u/c so the ply doubler provides mounting for the torque rod ply u/c mounts. Unlike the Flea Fli I would use 1/4 sq spruce spars ( actually 6mm square pine from B& Q probably) rather like a Kwik Fli3. Same wing section as Flea Fli about 16 percent. Why reduce it? The reason why I reduced rather than enlarged is that its easier to trace within lines. I wanted to get it into CAD just in case we needed to get the parts to a laser cutter. Enlarging tends to make tracking difficult as the lines become rather thick. I lifted a few of the design ideas from the Flea Fli as you noted. The wing is designed to be bolted (2 bolts, 1 peg) and the formers around the wing have been relocated. I may redo F2 and make it 1 piece. I am not sure why I split it. It seemed a good idea at the time. I have used a Liteply plate for the LiPo. It actually passes down through F2 so you have plenty of scope to move the LiPo to get the correct CG and there is also plenty of space around the LiPo to get it out the top hatch. I was actually a bit worried the nose may be too long - especially for the ic version. I have found that scaling downwards tends to leave the model nose heavy as the engine mass is not reduced proportionally. As this is only a 90% scale I think we will be OK, but 80% caused big problems for my Curare 25. I think that I will make a lower hatch for the ESC under the LiPo but I need to make sure that I don't foul the noseleg steering. The wing section was reduced to make the model less susceptible to turbulence and wind gusts. Here is the original from MAN, its not a vast difference but it was a section that was very similar and already available in Profili. When I scanned the original, there were too many lumps and bumps, The revised section is a NACA 63015A. I think it will be fine. Another idea i have is to just use the proper Flea Fli enlarged airfoil which would allow the wing to be built flat on the board by using the Peter Miller method - putting the LE and TE sheeting down first allows just enough clearance. ( the cap strips are omitted until later ) Avoids propping the LE up with blocks. I have worked out that the original section used by Phil was a NACA 63-018A with the nose radius reduced to 2%. I will redraw with the correct wing section.. It doesn't look too bad. Ian - I think this is a better size. I found the Flea Fli just a little too small so it gets overlooked. I have always liked 40 sized models, they fly well and are easier to build strong and light. Need to keep the AUW down to less that 2Kg for this if we want a reasonable aerobatic performance. So you read Phil K's article and changed your wing section! When is a classic aerobatic design not a classic? Does resizing rule it out? Does changing the wing section still conform to classic regulations? Does changing a tricycle to a taildragger cause offence? Just wondering if Martyn's design qualifies as a classic. Personally I just build models to fly well and not worry about conforming to classic or vintage classes but there may be those who want to take part in classic events. I was already aware of the article and also aware of the 'Fish tailing' that the design is susceptible to. (Anyone reading this and is not aware, its not worth losing sleep over - basically on fast and straight flight, the model can wag its tail visibly - but not very much - its called "character" - My KF4 does it and so do a couple of others I have). TBH, the difference in thickness between 15 and 18% is marginal and happy to go with the flow. No matter what, it is far more important that the model is built as light as is reasonably possible (without compromising its toughness). To answer your questions about defining a Classic. 1. A Classic must maintain the same outline and basic dimensional ratios and should be built from a plan that was published in the era in question - Eras are basically by decade, 60's, 70's etc The UKCAA Classic cut off date is currently 31/12/1985 but we have a motion tabled at the AGM to extend the date to 31/12/1995. 3. Minor changes in wing sections are OK - they should be visibly similar by eyeball. 4. Changes in constructional materials are generally OK, for example substituting a built up deck with a foam deck, use of glass or carbon for local reinforcement, using built up to replace foam wings or vise versa. 5. The spirit is that the model should be representative and recognisable as a model of the era in question without having to resort to physical measurement. Re: Fish-tailing. This was a well known "feature" of the Kwik-Fli, back in the day. A fellow club member got so fed up with his doing it that he rebuilt the tail as a thin symmetrical section, rather than a flat plate. This completely cured it....! The "Kwik flip dance" is well documented. Cures seem to be by adding wing to fuselage fillets or by gluing an 1/8 inch square strip of hard balsa or spruce approx. 2ins long vertically on each side of the trailing edge of the rudder. Incidentally I think the size that has been drawn up will be right for many people. Sorry that should be the Kwik Fli dance. Thanks Chris - doesn't auto correct drive you round the bend. Back to the wing section debate.. It was the UK "high winds and turbulence" that the mid-west US of A don't seem to suffer from as much.. Anyway - I am not changing it again. 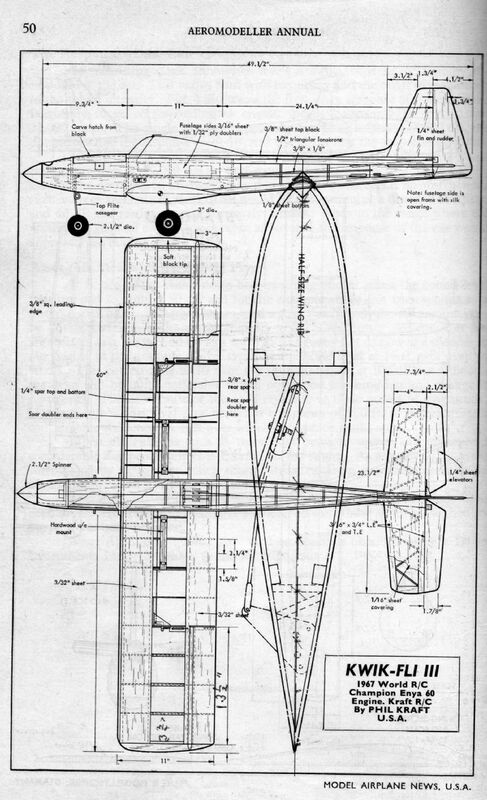 its redrawn with the original wing section. Thanks for the clarification of classic 'rules'. As you didn't comment on taildragger I assume that probably means it's heresy to modify a tricycle! I will do it anyway. I am not sure whether your cowl for the electric version is just screwed on or glued on. If glued on the nosering might need a gap to allow the motor shaft to go thro for installation or replacement. I am wondering whether the horizontal mounting of the u/c right angle bend on the bearer is a proven method? My view is that it would twist and just push the bottom of the rib out. In the usual vertical mounting it pushes against the spars & whole rib length rather than just the tiny narrow bit under the bearer.